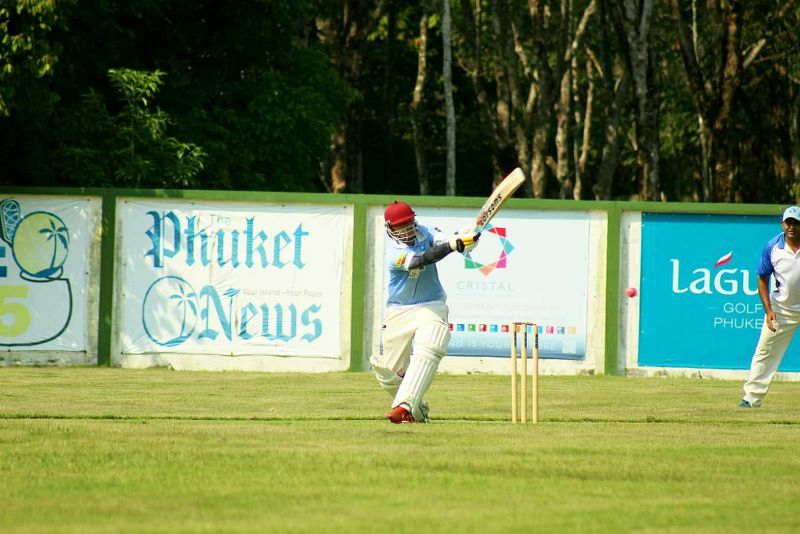 CRICKET: After a two-year hiatus, the ‘annual’ North vs South cricket match came back with a bang at the ACG Cricket and Sports Facility (ACG) last Sunday (Dec 23). The South was made up of 10 South Africans and a Kiwi, while the North had a far more balanced mix of players from the sub-continent and the UK. The North won the toss and chose to bat in the 40-overs-per-side contest. The northern opening pair of Jeremy Bootsy and Adam Drew had to work through a fiery opening spell from the South’s Ryan Kohler, as he had them hopping around in the crease to evade his lightning bolts. But, with experience on their side, they patiently picked off the bad balls from the other bowlers and moved the score on to 38 before R Kohler eventually got his rewards by having A Drew (10) chop the ball onto his own stumps. 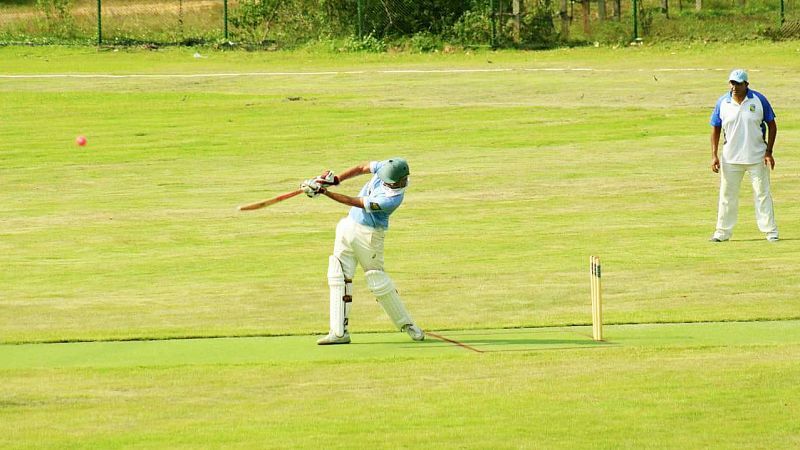 That brought in Manish Sandarangani (13), who never settled after twice being hit on the helmet by the ever-dangerous R Kohler (1/27) and was soon out caught behind by keeper Van Blerk off the bowling of newcomer Alex Sechiari. Paddy Ledeboer came to the crease and from the outset took the game by the scruff of the neck and belted the South’s bowlers to all corners of the ground and the cow fields that lie beyond them. Leaving J Bootsy (64) to play the anchor role at the other end which he did to perfection, until eventually being run out as he tired in the heat of the midday sun. Rishi Sandarangani was next up and after being sledged by the Souths captain A Van Blerk for not making contact with any of his first five balls, calmly dispatched balls 6, 7 and 8 over the fence for maximums. The North, realising this was their opportunity to turn up the heat as Rishi and Ledeboer, in tandem, put on a devastating display of clean hitting as they treated every bowler that took the ball with the same level of disdain, moving the score towards 240 with 11 overs still remaining. The South needed a moment and that moment would come just before the second drinks break as Van Blerk held on to a sublime diving catch to dismiss R Sadarangani (65) off the bowling of Matt Kohler. This helped slow the North’s avalanche of runs somewhat as the North’s captain, Seemant Raju (32), and Ledeboer (65) kept the scoreboard ticking over, but, not with the same freedom as they had before the loss of R Sadarangani. M Kohler (3/41) would eventually get both their wickets before the tail-enders, M Rehman (18) and MS Khan (12) helped the North eventually post 311 for 7 after their 40 overs. Leaving the South with 312 to win. The South sent in Ike Bekker as a pinch hitter to wrestle back the initiative by getting them off to a quick start along with regular left-hand opening batsman and the South’s only non-South African, Michael Flowers. Bekker (24), playing with freedom, did exactly what he was sent in to do before an excellent catch by R Sadarangani brought his brief innings to an end. They almost had a second wicket not long after as M Flowers was caught by Mudasir Rehman, off Pir Sami, but the chest-high ball was rightly called a no-ball by the square leg umpire and Flowers was left to soldier on. The North only had to wait for three balls to again celebrate a wicket as the normally devastating Matt Kohler (0) went cheaply, caught at slip by MS Kahn off the bowling of Shivam. Craig Morgan came and went for a brief yet impressive 17 when he misjudged an M Rehman inswinger to be clean bowled. All the while Flowers ticked along at the other end, playing some beautiful shots all around the park. Alex Sechiari (27) came to the wicket and after shaking off the initial rust from not playing for a number of years, settled in to play some lovely strokes before giving the North’s captain Seemant Raju (1/20) his only wicket, caught behind by M Sadarangani. The left-handed Kiwi, Flowers, needed a partner to help steady the ship and as is so often the case, the man they turn to is the South’s captain Anthony Van Blerk who waddled to the crease with nearly 50 years of cricketing experience under his belt. Both batsmen could feel the calming influence he brought to the wicket, as over by over, they kept the score ticking along above the asking run rate, taking the score towards the 200 mark before Van Blerk (35) got a leading edge to give Ned Symons (1/57) a simple caught and bowled chance, which he gladly accepted. Lyle Simmo now joined Flowers who was now seizing up with cramp and starting to struggle as the required run rate crept closer to 9 an over. Flowers (90) would eventually fall to the faintest of edges off the always dangerous bowling of M Rehman, caught behind by the Jeremy Bootsy who had now donned the keeping gloves. This would, however, be the final wicket for the North as the athletic J Robertson now joined Simmo and with a keen eye on the required run rate, used an astute mix of quick singles and aggression to move the South closer and closer to the promised land. Needing 34 to win off the final three overs the South knew it was the time to strike and with some hefty blows by both batsmen got their noses ahead for the final time. Simmo was left to close out the match with a beautiful four, with just five balls remaining in the match. 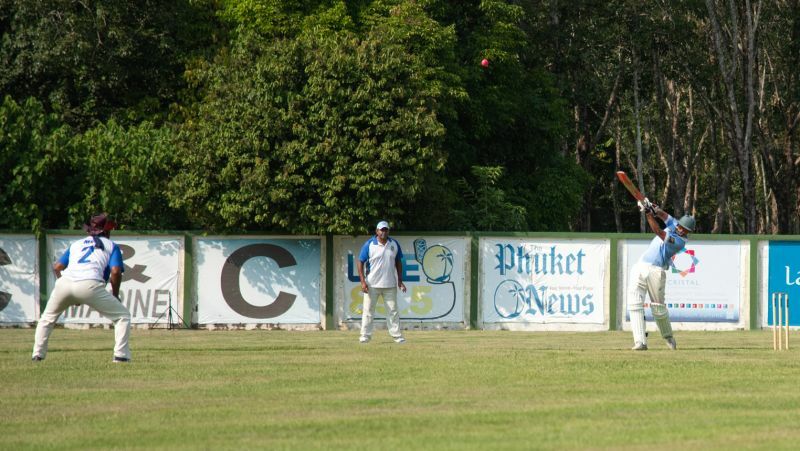 The players from the South engulfed the field to celebrate with the two batsmen in emotional scenes that were a fitting end to an excellent game of cricket played in fantastic spirits on a hot day in Phuket’s high season. The run chase was later found to be the largest run chase in the history of the ACG.